We believe mindfulness, exercise and nutrition are the cornerstones of a happy and healthy life. Therefor our skin plays an important part, as it also tells the world how we’re feeling inside by reflecting our mental and physical condition. If you are happy, then so is your skin and you feel skin happiness. Healthy skin influences your wellbeing, your emotions, and how you feel. Healthy skin helps to make you more confident and self-assured. Only healthy skin can feel skin happiness. When you’re happy, you smile automatically and your beauty becomes even more evident. Your face is radiant and you love it. 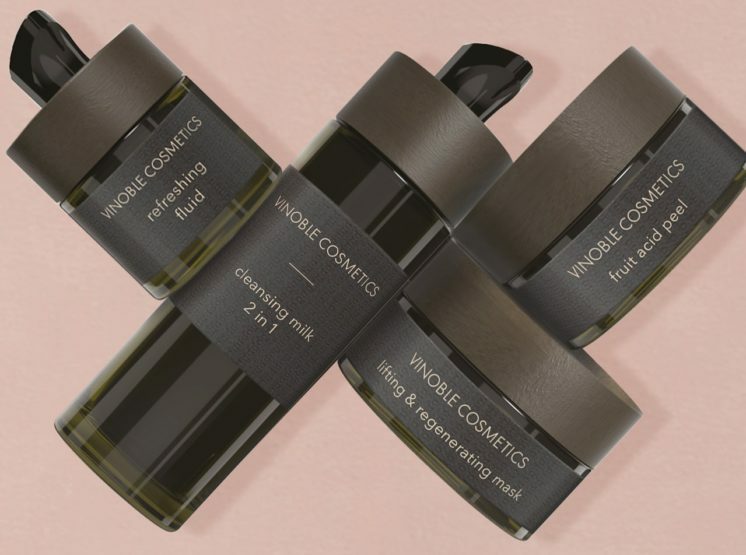 Happy skin therefore makes a big contribution to your general wellbeing. To keep the skin happy and healthy, it is essential to give your biggest sense organ some daily love and affection. There are many simple things you can do to make your skin glow. Use a mild cleansing product every day to free your skin from dirt and grime. Our cleansing milk 2 in 1 cleanses and removes make-up intensively without drying it out. Provide your skin with plenty of moisture. Therefor natural ingredients are the best, because they improve the health of your skin and supply it with everything it needs. 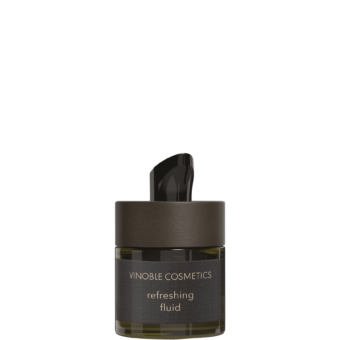 The refreshing fluid works like a freshness boost and puts a smile on your face. Treat your skin to something special at least once a week with a gentle scrub or a nourishing mask. The fruit acid peel removes dead skin cells, ensures a clear complexion and makes you look radiant. 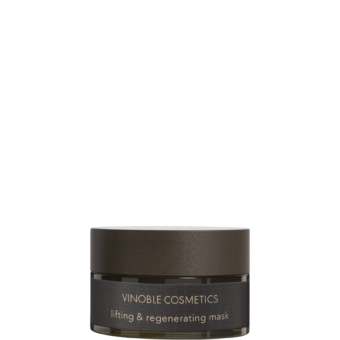 The lifting & regenerating mask tightens and regenerates your skin with valuable tannins from red wine. Enjoy a glass of wine to enhance the feeling of relaxation. Visit a spa. After a stressful period, take some time out to unwind and let yourself be pampered in a spa. Our Spa Finder will show you the most beautiful Vinoble spas. A happy life is essential – but which aspects give you even happier skin? Happy smile: Smile! Show the kind of smile you would like to see on the faces of others, without waiting for them to show it first. Smile at people you meet – they’ll smile back and feel better. Smile at the world and you’ll make others happy. Your skin will also be happy, because when we laugh, endorphins are released and 15 facial muscles are tensed. Happy food: A healthy diet is the basis for a happy and healthy life. Eat lots of colorful fruits and vegetables and drink plenty of water. Water is especially important for maintaining the skin’s moisture levels. However, try to cut out bad habits. But you can still treat yourself to a cocktail or a piece of chocolate every now and then. Take your time when eating, and enjoy your meals in quiet surroundings. Happy place: You’re sure to have a special place that reminds you of happy moments. Whether it’s your favorite café or a beautiful nature spot. Once you have found this place, hold onto it and keep visiting it again and again. It will make your skin glow. Happy breathing: Try to keep stress to a minimum. Whenever you can’t manage during a stressful moment, take a deep breath and concentrate entirely on your breathing for a few minutes. Close your eyes and focus only on the here and now. It will calm your body and prevent wrinkles and frown lines from forming. Make a conscious effort to take these breaks every day, even if you’re not feeling stressed – it will help you maintain your positive outlook on life. Happy fitness: Exercise helps to supply the skin with oxygen and nutrients, making it look young and healthy. Take some time out for a long walk on weekends, for example. Or enjoy the fresh air in the mountains or by the lake. You’ll not only be doing something for your fitness but also for your mind. Happy sleep: Shut off your engine and enjoy a good night’s sleep. Sufficient sleep is the best remedy against an overactive mind. Consequently getting plenty of sleep will also make you look and feel good. This is because the skin regenerates overnight, so that it’s ready to radiate again in the morning. Consider sleep a necessity and not a luxury. Let yourself be inspired to heartfelt laughter and enjoy those special moments for yourself. We wish you all-round #SkinHappiness!